"Lincoln Center" redirects here. For other uses, see Lincoln Center (disambiguation). Lincoln Center for the Performing Arts (simply known as Lincoln Center) is a 16.3-acre (6.6-hectare) complex of buildings in the Lincoln Square neighborhood of the borough of Manhattan in New York City. 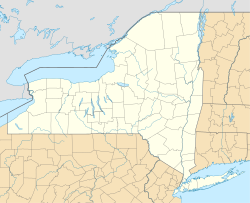 It hosts many notable performing arts organizations, which are nationally and internationally renowned, including the New York Philharmonic, the Metropolitan Opera, the New York City Ballet and the New York City Opera. A consortium of civic leaders and others led by, and under the initiative of, John D. Rockefeller III built Lincoln Center as part of the "Lincoln Square Renewal Project" during Robert Moses' program of urban renewal in the 1950s and 1960s. Respected architects were contracted to design the major buildings on the site, and over the next thirty years the previously diverse working class area around Lincoln Center was replaced with a conglomeration of high culture to please the tastes of the consortium. Rockefeller was Lincoln Center's inaugural president from 1956 and became its chairman in 1961. He is credited with raising more than half of the $184.5 million in private funds needed to build the complex, including drawing on his own funds; the Rockefeller Brothers Fund also contributed to the project. The center's three buildings, David Geffen Hall (formerly Avery Fisher Hall, originally named Philharmonic Hall), David H. Koch Theater (formerly the New York State Theater) and the Metropolitan Opera House were opened in 1962, 1964 and 1966, respectively. While the center may have been named because it was located in the Lincoln Square neighborhood, it is unclear whether the area was named as a tribute to U.S. President Abraham Lincoln. The name was bestowed on the area in 1906 by the New York City Board of Aldermen, but records give no reason for choosing that name. There has long been speculation that the name came from a local landowner, because the square was previously named Lincoln Square. City records from the time show only the names Johannes van Bruch, Thomas Hall, Stephan de Lancey, James de Lancey, James de Lancey, Jr. and John Somerindyck as area property owners. One speculation is that references to President Lincoln were omitted from the records because the mayor in 1906 was George B. McClellan Jr., son of General George B. McClellan, who was general-in-chief of the Union Army early in the American Civil War and a bitter rival of Lincoln's. Davis, Brody and Associates: The Samuel B. and David Rose Building. The development of the condominium at 3 Lincoln Center, completed in 1991, designed by Lee Jablin of Harman Jablin Architects, made possible the expansion of The Juilliard School and the School of American Ballet. The center's cultural institutions also make use of facilities located away from the main campus. In 2004, the center expanded through the addition of Jazz at Lincoln Center's newly built facilities, the Frederick P. Rose Hall, at the new Time Warner Center, located a few blocks to the south. In March 2006, the center launched construction on a major redevelopment plan that modernized, renovated, and opened up its campus. Redevelopment was completed in 2012 with the completion of the President's Bridge over West 65th Street. When first announced in 1999, Lincoln Center's campuswide redevelopment was to cost $1.5 billion over 10 years and radically transform the campus. The center management held an architectural competition, won by the British architect Norman Foster in 2005, but did not approve a full scale redesign until 2012, in part because of the need to raise $300 million in construction costs and the New York Philharmonic's fear that it might lose audiences and revenue while it was displaced. Among the architects that have been involved were Frank Gehry; Cooper, Robertson & Partners; Skidmore, Owings & Merrill; Beyer Blinder Belle; Fox & Fowle; Olin Partnership; and Diller & Scofidio. In March 2006, the center launched the 65th Street Project – part of a major redevelopment plan continuing through the fall of 2012 – to create a new pedestrian promenade designed to improve accessibility and the aesthetics of that area of the campus. Additionally, Alice Tully Hall was modernized and reopened to critical and popular acclaim in 2009 and the Film Society of Lincoln Center expanded with the new Elinor Bunin Munroe Film Center. Topped by a sloping lawn roof, the film center is part of a new pavilion that also houses a destination restaurant named Lincoln, as well as offices. Subsequent projects were added which addressed improvements to the main plazas and Columbus Avenue Grand Stairs. Under the direction of the Lincoln Center Development Project, Diller Scofidio + Renfro in association with FXFOWLE Architects and Beyer Blinder Belle Architects provided the design services. Additionally, Turner Construction Company and RCDolner, LLC were the construction managers for the projects. Another component to redevelopment was the addition of the David Rubenstein Atrium designed by Tod Williams Billie Tsien Architects, a visitors' center and a gateway to the center that offers free performances, day-of-discount tickets, food, and free Wi-Fi. 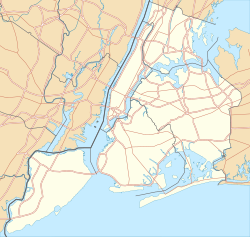 April 21, 1955: San Juan Hill (Historic New York City Neighborhood) designated for urban renewal. December 4, 1981: The Big Apple Circus marks its first performances at its winter home in Damrosch Park. The circus has performed every winter at Lincoln Center through the 2016 season when it was forced to liquidate its assets due to continued financial losses. September 2, 1986: Former Jewish Defense League National Chairman Victor Vancier throws a tear gas grenade during a performance of Soviet ballet in the Metropolitan Opera House as a protest against the Soviet practice of not letting its Jews emigrate to Israel. August 20, 2006: Paul Milstein Plaza is dismantled as part of 65th Street Redevelopment project. October 1, 2013: the New York City Opera files for Chapter 11 bankruptcy reorganization and ceases operation. Damrosch Park: an outdoor amphitheater with a bowl-style stage known as the Guggenheim Band Shell; used for free Lincoln Center Out of Doors presentations and with a special dance floor for Midsummer Night Swing. Lincoln Center for the Performing Arts (LCPA) is one of the eleven resident organizations, and serves three primary roles: presenter of artistic programming, national leader in arts and education and community relations, and manager of the center's campus. As the world's largest presenter of performing arts offering some 5,000 programs, initiatives and events annually, its programs include American Songbook, Great Performers, Lincoln Center Festival, Lincoln Center Out of Doors, Midsummer Night Swing, the Mostly Mozart Festival, Target Free Thursdays, the White Light Festival and the Emmy Award–winning Live from Lincoln Center. In July 2006, the LCPA announced it would join with publishing company John Wiley & Sons to publish at least 15 books on performing arts, and would draw on the Lincoln Center Institute's educational background and archives. Lincoln Center Cultural Innovation Fund is the first of its kind as a grant program that seeks to bring art and develop art-going habits in some of New York City's poorest neighborhoods. Funding through a partnership with the Rockefeller Foundation the new pilot grant program encourages the use of art as an innovative strategy to access and participate in cultural opportunities in diverse neighborhoods in Central Brooklyn and the South Bronx. Each of the 12 grantees will receive support and financial backing for their project with the over all goal of the program is to support non- profit organizations in creating cultural innovative strategies that increase art participation and the range and availability of cultural activities to underserved communities. ^ a b "Rockefeller Philanthropy: Lincoln Center" (PDF format). ^ Roth, Leland M. (2001). American Architecture: A History. Boulder, Colo.: Westview Press. ISBN 9780813336619, ISBN 9780813336626. OCLC 47867623. ^ Gray, Christopher (October 2, 2005). "Streetscapes: Readers' Questions; The Story of a Name, the Tale of a Co-op". The New York Times. Retrieved May 18, 2012. ^ Collins, Glenn (May 11, 2009). "50 Years In, Center's Name Is Still a Mystery". The New York Times. Retrieved November 15, 2010. ^ a b "Transforming Lincoln Center: Architecture and Design". Lincoln Center. Retrieved January 2, 2018. ^ "Lincoln Center: New Public Spaces and Amenities" (PDF). Lincoln Center. Retrieved January 2, 2018. ^ a b "Lincoln Center: Alice Tully Hall Fact Sheet" (PDF). Lincoln Center. Retrieved January 2, 2018. ^ a b "Lincoln Center: West 65th Street Project Fact Sheet" (PDF). Lincoln Center. Retrieved January 2, 2018. ^ a b c d "Lincoln Center: Josie Robertson Plaza / Columbus Avenue" (PDF). Lincoln Center. Retrieved January 2, 2018. ^ a b c "Lincoln Center Revson Fountain Fact Sheet" (PDF). Lincoln Center. Retrieved January 2, 2018. ^ "Lincoln Center: President's Bridge at Lincoln Center" (PDF). Lincoln Center. Retrieved January 2, 2018. ^ "Lincoln Center: David Rubenstein Atrium at Lincoln Center Fact Sheet" (PDF). Lincoln Center. Retrieved January 2, 2018. ^ a b Goldberger, Paul (July 28, 1991). "Architecture View". The New York Times. ^ Gill, Brendan (August 19, 1991). "The Skyline". The New Yorker. pp. 57–60. ^ Bosco, Pearl (November 1989). "Three Lincoln Center". Institute for Urban Design. Project Monograph. Vol. 2, No. 4. ^ a b Pogrebin, Robin. (October 1, 2012) "New Bridge at Lincoln Center to Open Monday". The New York Times Retrieved May 23, 2014. ^ Robin Pogrebin (May 8, 2003), "Lincoln Center Proceeds, Modestly". The New York Times. ^ Pogrebin, Robin (November 28, 2012), "Avery Fisher Hall to Be Renovated". The New York Times. ^ Pogrebin, Robin. (June 19, 2003), "Costs and Approach Disputed in Lincoln Center Redevelopment". The New York Times. ^ "RCDolner Construction". Rcdolner.com. 2012-05-11. Retrieved 2017-05-31. ^ Pogrebin, Robin (August 17, 2006). "On 65th Street, Glimpsing Lincoln Center's Future". The New York Times. Retrieved July 31, 2010. ^ Davis, Janet M. (January 17, 2017). "Farewell Ringling Bros., but the circus isn't dead". CNN. Retrieved January 18, 2018. ^ Sisario, Ben. (May 6, 2008) "Tully Hall to Reopen in 2009 With Eclectic Music Festival" The New York Times Retrieved May 23, 2014. ^ Ouroussoff, Nicolai (May 20, 2010). "The Greening of Lincoln Center". The New York Times. Retrieved July 31, 2010. ^ Pogrebin, Robin. "Lincoln Center Turns to Broadway for Its Next Chief". The New York Times. Retrieved May 12, 2014. ^ "New York City Opera To File For Bankruptcy". Billboard. Retrieved January 18, 2018. ^ Smith Jennifer (September 24, 2015) "Lincoln Center Concert Hall Renamed for David Geffen". The Wall Street Journal Retrieved September 27, 2015. ^ Stearns, David Patrick (January 25, 2016). "New York City Opera's resurrection may be right". Philadelphia Inquirer. Retrieved January 18, 2018. ^ "Lincoln Center for the Performing Arts Appoints Debora L. Spar as President and CEO" (Press release). Lincoln Center. November 16, 2016. Retrieved 2017-08-07. ^ Morgan, Richard (May 5, 2016). "The bosses who got screwed for boning in the corner office". New York Post. Retrieved 2017-08-07. ^ See Mitzi E. Newhouse Theater at the Internet Off-Broadway Database for a list of productions in the venue. ^ Pogrebin, Robin. (October 8, 2013) "$4 Million Grant to Help Rebrand Lincoln Center Institute" The New York Times Retrieved May 23, 2014. 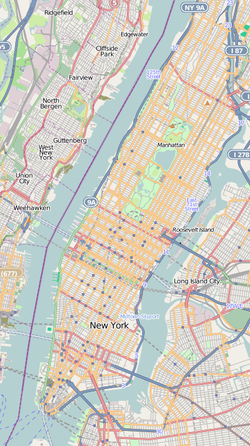 ^ "Map of Lincoln Center" Archived July 2, 2014, at the Wayback Machine. Retrieved May 23, 2014. ^ a b "What Is Lincoln Center, and What Is a Resident Organization?". Lincoln Center for the Performing Arts. Retrieved 2017-08-07. ^ "About Lincoln Center for the Performing Arts, Inc. (LCPA)". About Lincoln Center and Lincoln Center for the Performing Arts, Inc. (LCPA). Retrieved May 23, 2014. ^ [dead link] Maul, Kimberly (July 27, 2006). "Wiley and Lincoln Center Dance Together"[permanent dead link]. The Book Standard. ^ Center, Foundation. "Lincoln Center Cultural Innovation Fund Awards Innovation Fund Grants". Philanthropy News Digest (PND). Retrieved 2017-11-08. ^ "Press Release | Lincoln Center for the Performing Arts". www.aboutlincolncenter.org. Retrieved 2017-11-08. Young, Edgar B. (1980). Lincoln Center: The Building of an Institution. New York: New York University Press. ISBN 9780814796566. OCLC 6446862. Wikimedia Commons has media related to Lincoln Center for the Performing Arts.